M, F, S, DUSK – 9:00 pm. With more dates opening up near Halloween. See our fall calendar. When the sun goes down, gather your courage and line up for the Cow Train (3 Tokens per child/Round Trip with paid admission. Children 2 and under FREE). DUSK – 9:00 pm, Monday, Friday, Saturday. ATTRACTION OPENS OCTOBER 7, 2019. Tokens may only be purchased at the Farm. Get General Admission Tickets HERE. Wick’a Dee, Candy Corn, and Autumn Crisp host this fun adventure around the eerie pond, through the tiny slightly-haunted shack, INTO the blazing cauldron for a photo with the witches, and inside their own Witch Hut. These witches will show you the true method of TRICK-or-Treating. They’ll tell scary tales and pose for photos with you in the dark. The witches are over-the-moon excited for your family to come! Looking for a not-too-scary Halloween fright for the kids? This spooky family-friendly attraction is great for toddlers on up. Don’t be afraid to step inside Staheli Family Farm’s tiny slightly-haunted shack. No horrific scenes. This attraction is super-chill and all good. It’s the perfect way for your kids to enjoy the fun of a haunted house while still being able to sleep in their own beds at night. Scaredy-cats have the option of not entering the haunted shack (Hey, it happens!). Last season, there were only a few tots too afraid to enter; even so, they perked right up when it was time to knock on the next door for a TRICK-OR-TREAT! Cow Train Depot located in the Farmland near the Pumpkin Patch. Our regular Cow Train ride closes at DUSK on M, F, S to transport the Spooky Trick-or-Treat Trail riders. Departs and returns often throughout the night. Parents walk alongside riding children. The Farm is full of fun! Grown-ups and teens allowed inside the Haunted Shack with paid Cow Train riders only. Wait at Cow Train Depot and pay 3 tokens per child riding. Adults walk to the east end of the pond and arrive at the Haunted Shack at the same time the Cow Train full of children arrives. Park strollers in the designated area. Help children exit the train to the north (left) of the Haunted Shack and wait at a safe distance as the Cow Train departs. Sit on the benches to receive instructions and await your turn. Enter the Haunted Shack. Take your time inside exploring the creepy sights and sounds, or close your eyes and hurry through; it’s up to you! Exit the Haunted Shack through the back door. Wait for a turn to plop your children into the cauldron for a photo with the witch! Continue along the trail behind the Witch Hut to the door of the Witch Hut. After receiving your treat (or trick) you may step inside the Witch Hut to see where she lives and practices her spelling. Another photo op is just outside the door. It’s a lighted pumpkin tree! Ask one of our witches to take a photo of your whole family. Head down the little hill to wait for the Cow Train at the “Train Station”. Be sure to take all of your belongings. 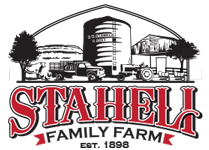 While waiting at the station, you may have an opportunity to purchase autographed pictures of your favorite Staheli Family Farm witches for 2 tokens. Includes a plastic sheet protector. What a fun way to show your appreciation for your visit to the land of the witches. Wait for the Cow Train to stop at the station before climbing in for a ride back to the Farmland. Parents quickly walk back to the Farmland. The Cow Train will make a few loops until you get back. Thank you for reading “How This Attraction Goes”, and Happy Halloween! BONUS: Families who attend Waffles & Witches on October 18, 19, or 26, 2019 will be able to stay all day or return later for this Spooky Trick-or-Treat Trail attraction! (with 3 tokens to ride the Cow Train). The Full Moon rises over the Spooky Trail each October in the Eastern sky. 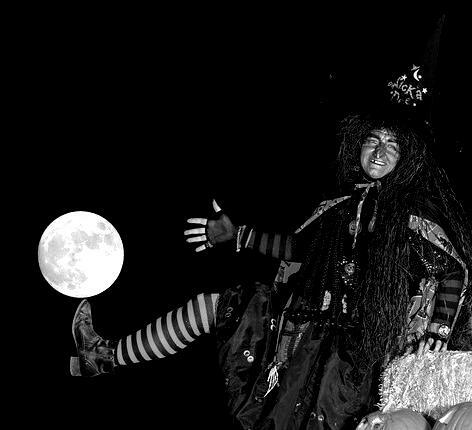 Bring your technology to capture this frightfully good show of moon magic on October 12 and 14, 2019, at about 7 pm! The Full Moon rarely disappoints (Weather permitting. Must be wearing admission wristband while on Farm property).